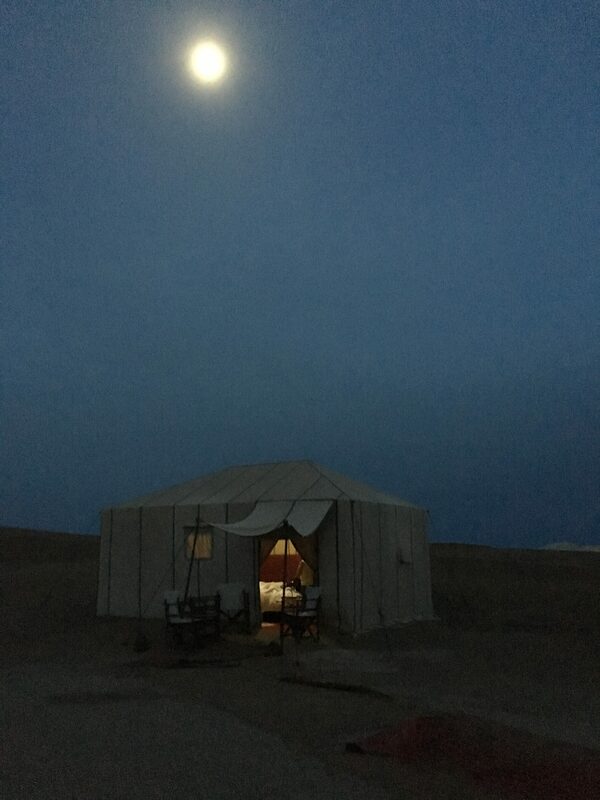 In our Sahara Desert tent, we rose early, with a full moon, before sunrise. As the early light in the east grew, Abdul brought coffee and we sat outside, enjoying our beverage. 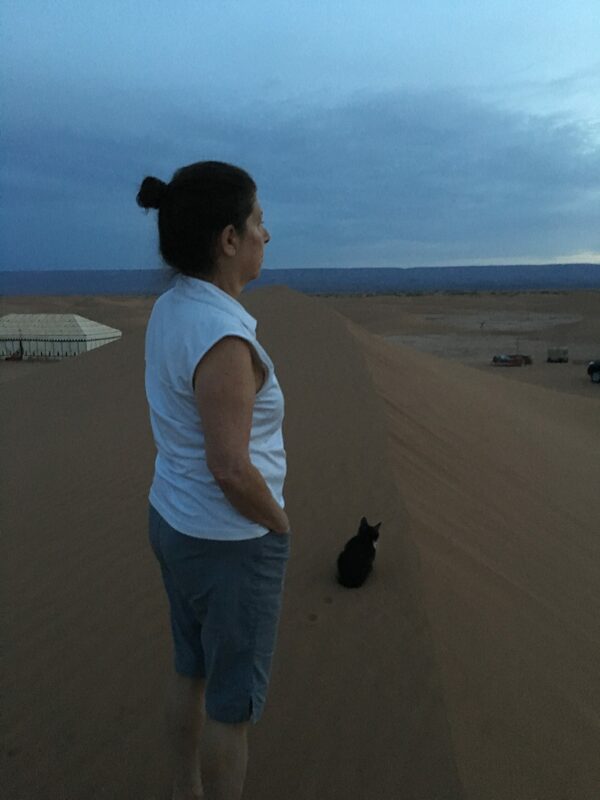 After a while, we walked barefoot through the cool sand, up the nearby dune, shadowed by the little black and white cat that had adopted us and slept at the foot of our bed. 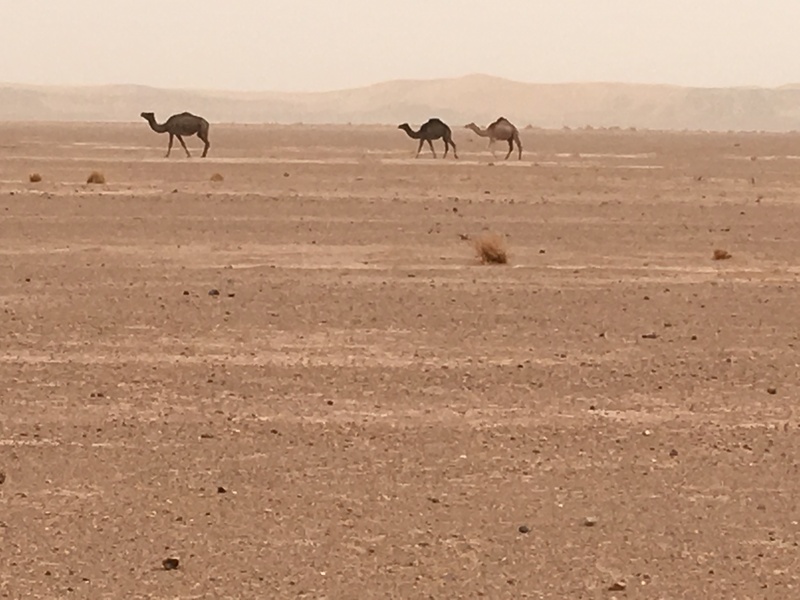 Our guide, Rashid, knew every detail of the desert in his heart– that the quality of the sand in the morning was different than in the afternoon. We stood for a long time in the windless quiet, with dunes rolling in all directions, as the light filled the overcast sky. 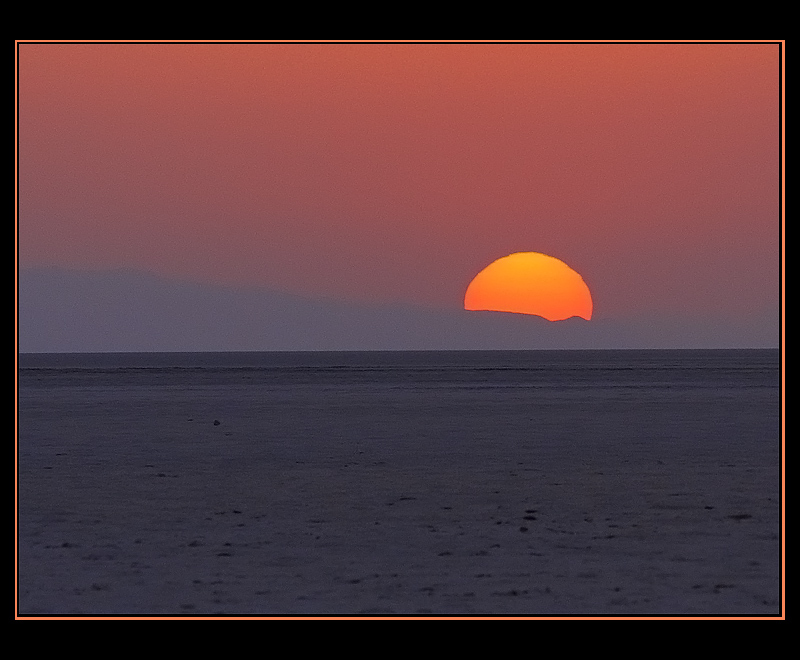 We sensed Rashid’s kinship with this moment and all the other transporting moments in the desert. He was off, out of sight, for his morning prayer. 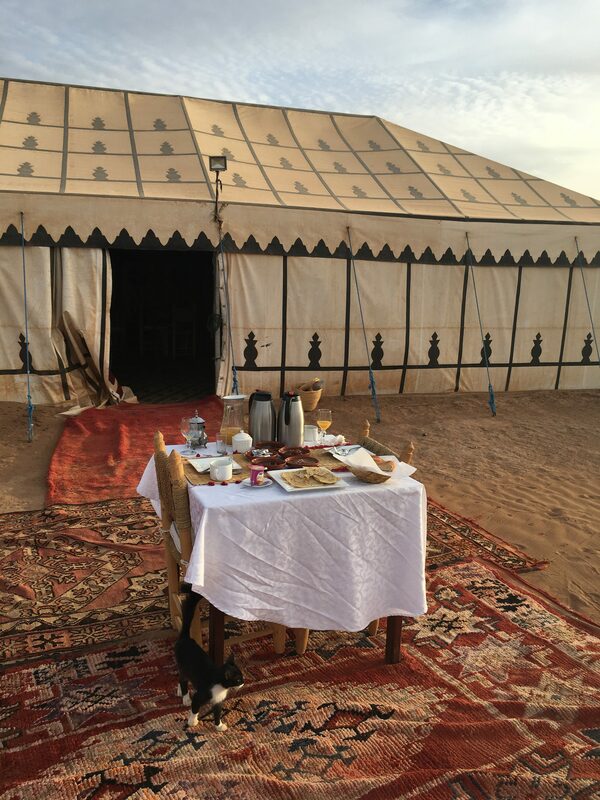 We were to be picked up at our riad in Marrakesh at 7:30 am, going to the Sahara Desert to stay at the Erg Chigaga Luxury Camp. 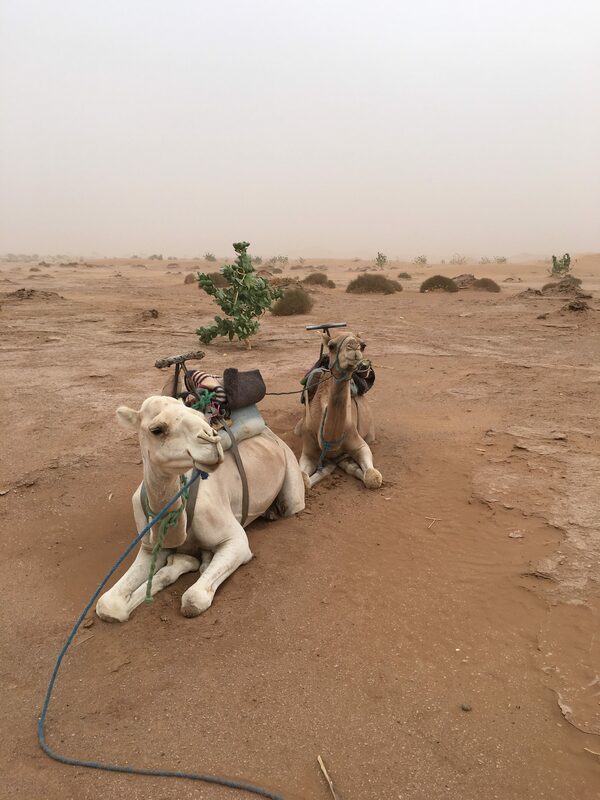 We signed up to ride on camels, and we thought that the desert was three hours away. That’s what we thought knew. As planned, we stepped out of the front door of our hotel and there, in the morning sun, was a man who we came to know as Rashid. Tall, in a bright blue robe and black turban. There was no car or van in sight. He took our bags and we docilely followed this stranger through the quiet early morning streets of the Kasbah, like ducklings, off into the unknown. He later explained that he is a Blue Man of the Sahara Desert, the Erg Chegaga. Once there, his garb seemed natural and perfectly functional, but in Marrakesh, it appeared to be a costume. We rounded the corner and found a new Toyota Land Cruiser and another Blue Man, Brahim, our driver. Our bags were stowed and we climbed into the back seat where we found water and cookies. Rashid rode shotgun and off we went through the winding passages of the Kasbah and out on the highway. Our three-hour tour turned out to be a 10-hour 450 km odyssey across Morocco, almost to the Algerian border, over the High Atlas Mountains, the Mid-Atlas Mountains, through countless towns and remote villages, over dry rivers, on good roads and hardly roads, and finally, off-road, into the desert. 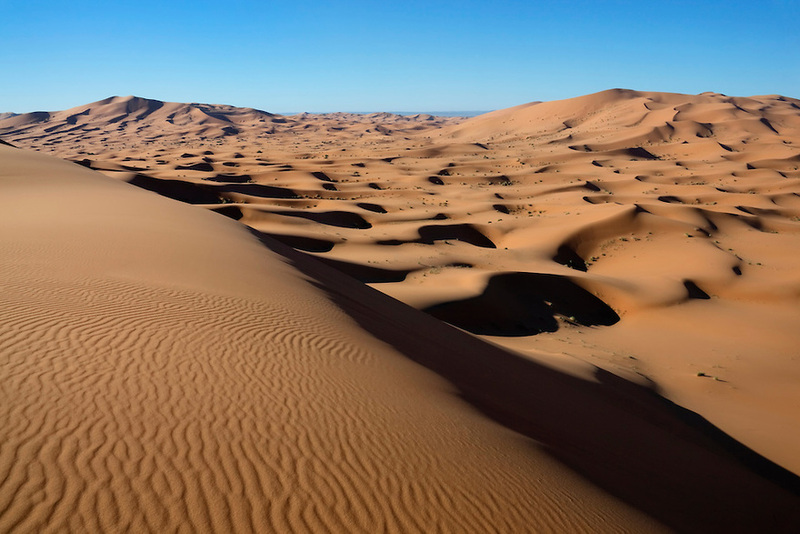 The terrain changed and changed again from parched mountains to rocky plains and finally to endless sand dunes, barren and waterless. During the entire trip, between quite moments of alternately looking out the window and napping, we enjoyed conversation with Rashid and Brahim. 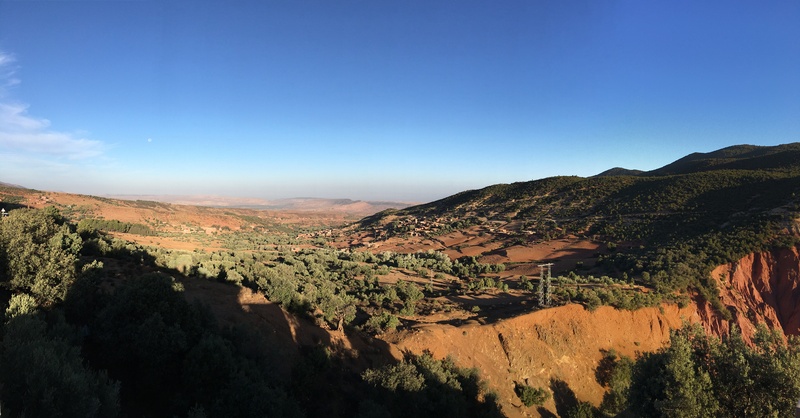 We asked about what we were seeing, about Morocco, about their life and family. It was a two-day education both touristic and personal. The position of women in Islam, drinking, polygamy—-we felt it right to be attentive listeners, not antagonistic promoters of our own story, and so, Rashid opened to us. He was born to a Bedouin nomad family in the desert. He is the oldest son. When he was 8, the family settled in the small town of Mhamid on the edge of the desert, ending a perhaps centuries long nomadic lineage. 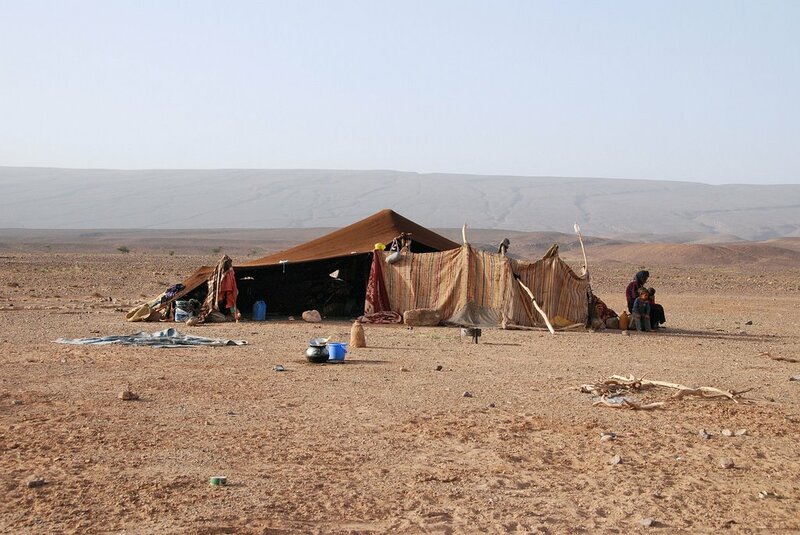 Brahim lives in Mhamid with his wife and several children. This team are on the road five or six days a week. Rashid had encyclopedic knowledge of everything around us. He never said, “I don’t know,” and while we had no idea if his answers were at all true or correct, he was convincingly confident in his delivery. 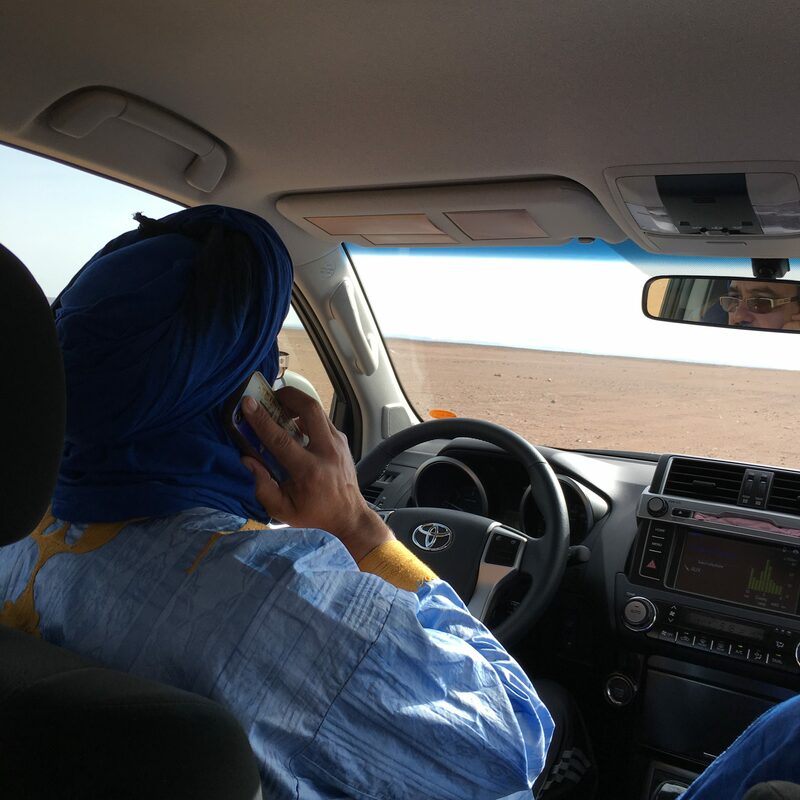 We were driving in the middle of the trackless desert with men who were born nomads in the Sahara, yet, as if we were driving on the streets of Oakland, both were constantly talking on their phones, with no hands free I might add. And Rashid had an amazing musical play list on his phone, with which serenaded he us during the whole trip, including an early morning Bob Marley set. Driving through the dunes is like piloting a small boat. The wheels spin, propelling the 4×4 forward, drifting through the turns. 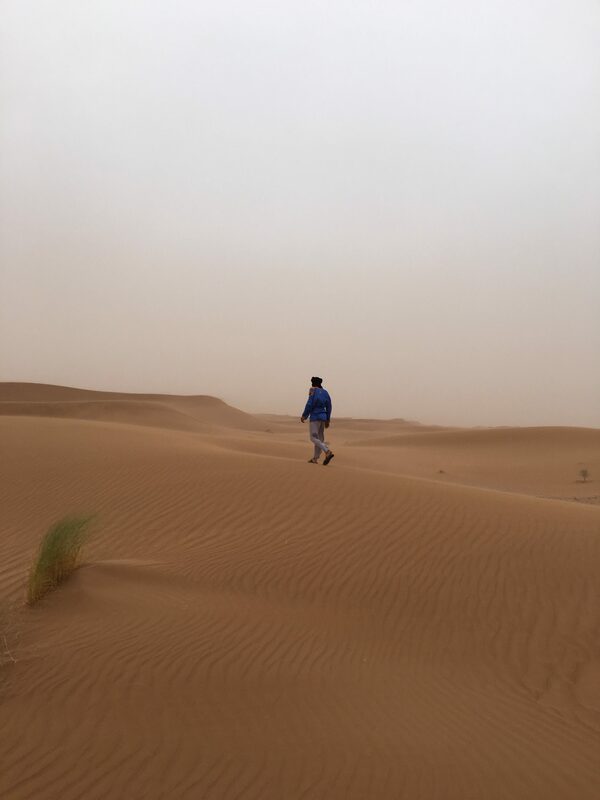 Brahim was an expert, weaving through the dunes on a track, hardly discernable. We ask if they ever got lost. They both immediately scoffed, “NEVER! Perhaps the mountain guides who come here do, but never us.” A brisk wind came up with blowing sand, sometimes reducing visibility to less than 30 feet. 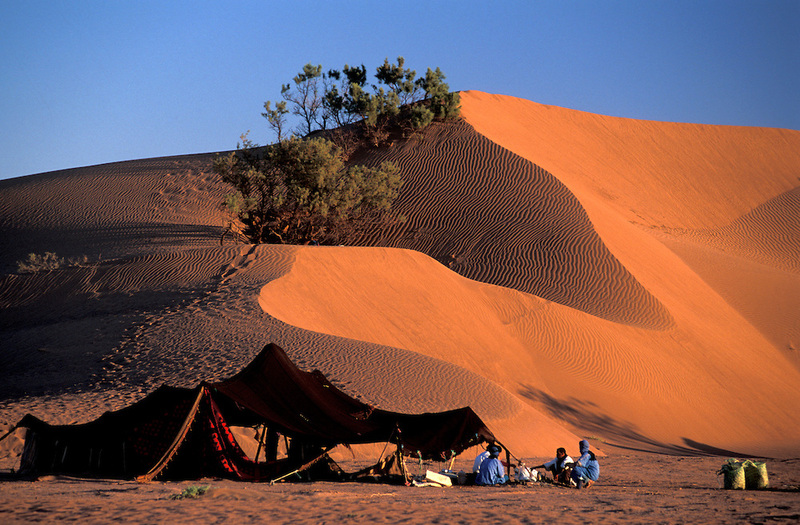 As we neared our camp, out of the sand gloom, appeared two kneeling camels and a Berber nomad seated nearby. As promised, our camel trek. Not a trek so much as a 90-minute journey through the dunes. Rashid accompanied us, sometimes talking with the Berber, sometimes walking off at a distance on the dunes, clearly in his element. 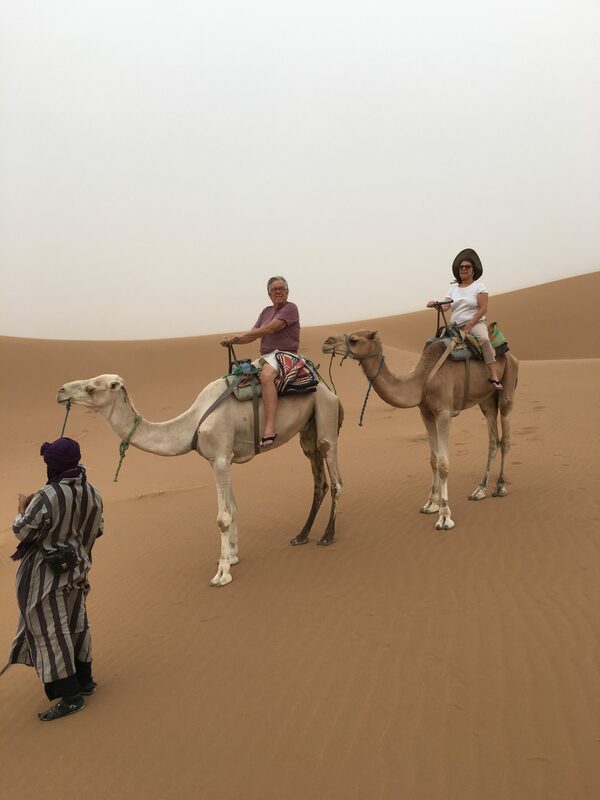 We feared that the camel ride would be unsatisfying and tacky, like a pony ride at a carnival, but this was a magical journey in the blowing sand, the easy rocking of our mounts and the dying light of the day. The dunes were endless with the wind whipping plumes of sand off the peaks and ridges. We were filled with wonder that we had only just put our toes in the beginnning of this desert, which rolls on like this for a thousand miles. Finally, arriving at the camp, we were greeted by our host Abdul. 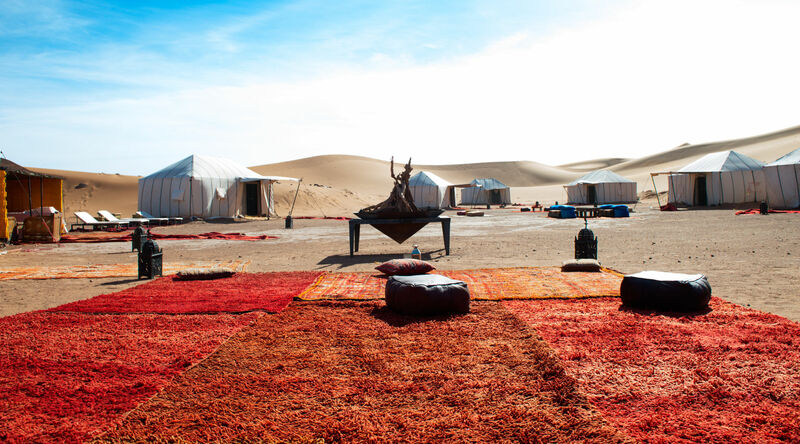 There was one larger tent for dining and a group of a dozen smaller tents in a big circle, the luxury accommodation. Our tent had a king bed, nice linens and decorations and the floor was covered with large carpets. It even had indoor plumbing, though the water was brackish, almost salty. 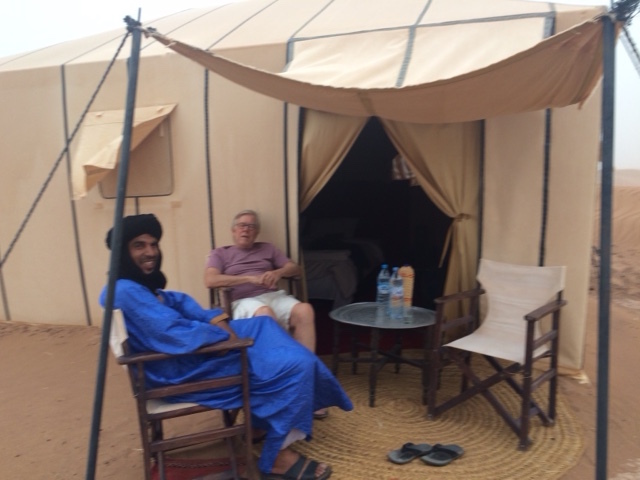 Everybody will tell you that you can’t get wine in the desert in a Muslim country, but our resourceful man of the desert came through and we found ourselves sitting outside our tent with a glass of wine continuing our day’s conversation with Rashid and Brahim until dinner. Usually there are 30 or 40 people in the camp with events and big meals, but we discovered that we were, by coincidence, the only visitors in the entire camp that night, cared for like pashas. It was profoundly quiet and we wandered around the camp in the quiet full moon light, dining alone in the big tent. After our sunrise walk, we had a big breakfast at an outdoor able for two. Then, off across the dunes on a 12-hour drive back to Marrakesh. 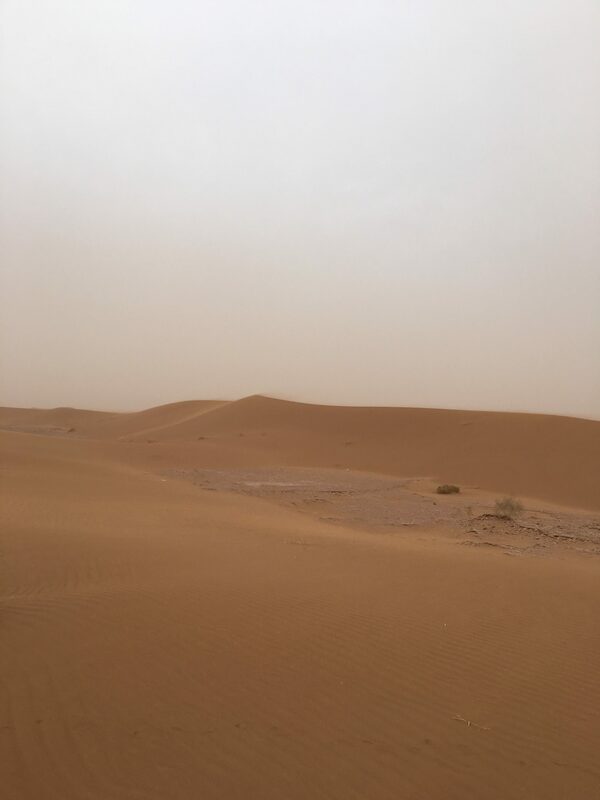 We had been driving and talking for about an hour after leaving camp, first in the dunes and then across rocky desert. We had seen nothing but signs of a few other desert camps. 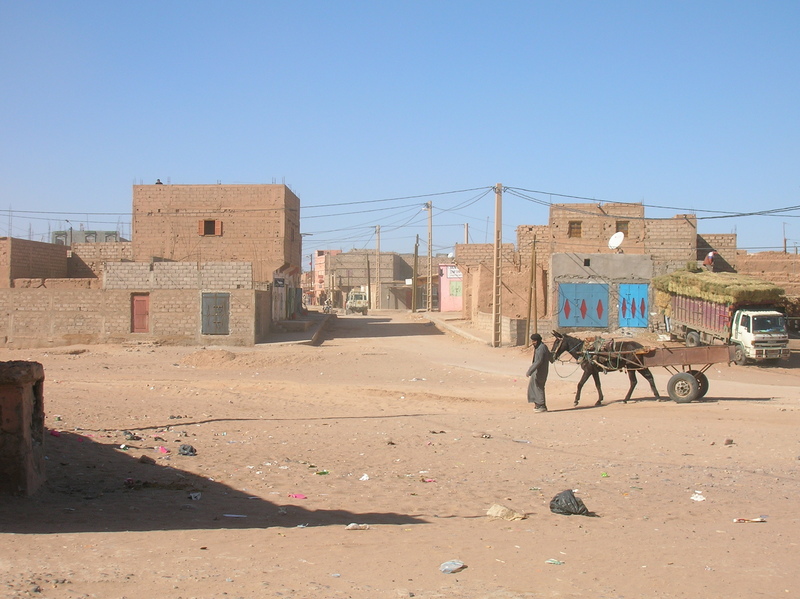 Then a building, then a few and we emerged into the village of Mhamid. The oasis at Mhamid has been settled since 3,000 BCE, but it’s early adobe buildings are in decay and with the encroaching desert the population has declined, now mostly a jumping off point for tourists. We stopped at a café and Rashid greeted each man on the terrace with different levels of familiarity. Clearly he knew everybody. They were probably all desert guides. There were no other women except Susan and she felt the sting of hostile male looks, and the complexity of cultural relativity. Brahim left to visit his family. On his return we headed out but were called back. Brahim had forgotten to give something to his 14-year old son. So we retraced our steps and met his son in the street. After getting the package from his father, he turned away, but Brahim insisted that he return and greet Rashid and then both of us. Salam Alaikum. We saw many more villages and towns of all shapes and sizes on the trip back. We ate lunch at a hotel in Quarzazati, the first time we had been around any other tourists in two days. 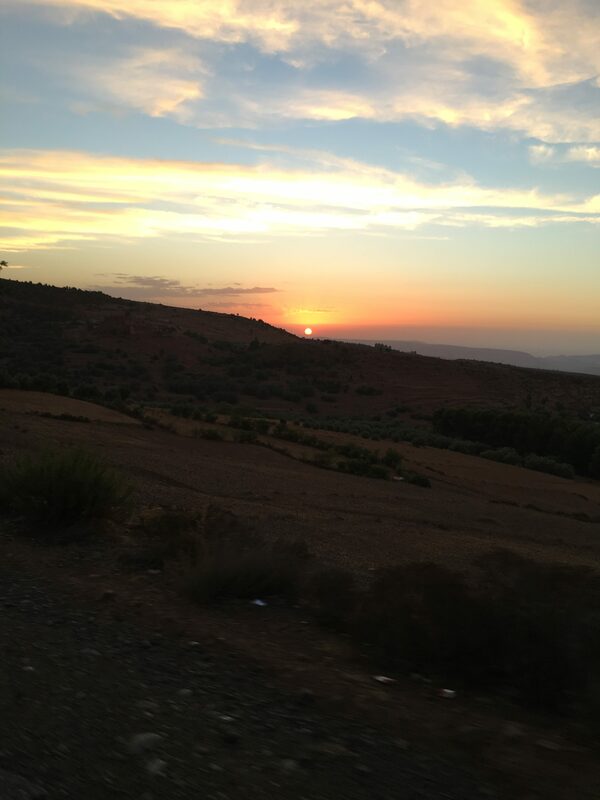 Then back to Marrakesh, over the mountains again, driving into the sunset. 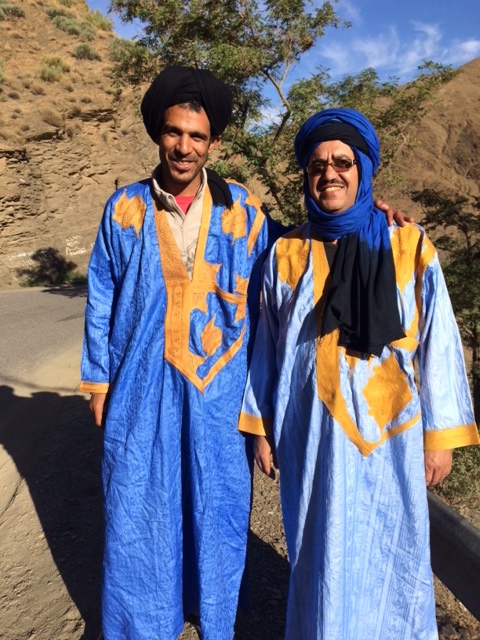 The tour through Morocco and especially the desert was wonderful, but what we really took away from the trip was the chance to get to know these two men from backgrounds so different than ours. We exchanged personal emails and invited them to stay with us if they ever landed on California. As we were parting, Brahim said, “Next time you will come and meet my family.” We knew we had made friends.